You have seen how I made Christmas ornaments this yr. Painted them. 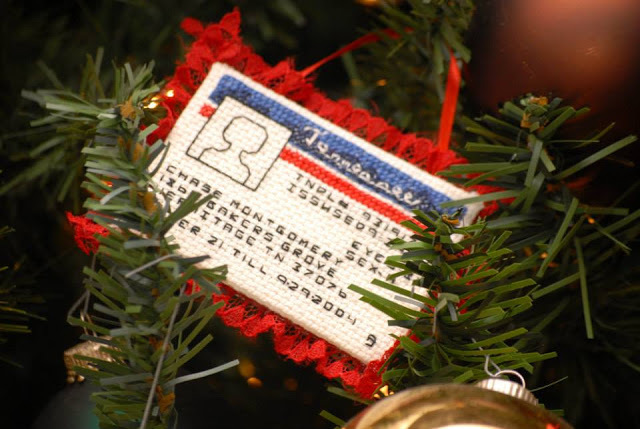 Years ago when I could see better, felt better, was younger and do more, and did not have Lily to attack my thread I did cross stitch ornaments. He is one I made when my nephew started driving. I had made one a couple years before this one when my daughter got her license. I drew out the design to cross stitch by from looking at her license. "Hey.....I want some pettings, stay right there, I am on the way down." Was at Wally World yesterday and bought myself something. A multi tool. Come in handy when I am working on something at the barn. Count down for Christmas cards is about done... This is card 13 and my all time fave one. 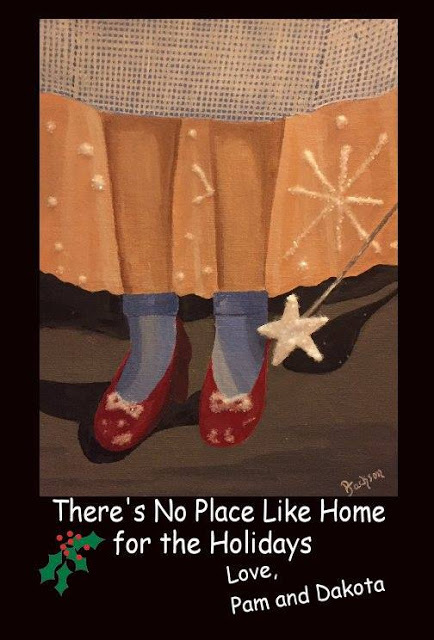 Theres no place like home... for the holidays! When going to the store lately I am trying really hard to make sure I don't buy sugary or scratch type foods. But the other night I ran in Aldi's store to grab a few things and saw this.. I walked past it....twice. Went back and got some anyway. A mistake I don't need to make again. IT WAS SO GOOD. haha.. To help get it out of the house I sent a bunch home with my youngest brother yesterday. I made some veggie soup and cornbread, it was his day off so I sent him some. He called today to tell me that he ate some soup last night and more today. BUT he finished off the popcorn treats last night! Caught this sunset last night on the way to the barn. I spend my mornings doing my coffee and surfing PINTEREST, playing on Facebook and checking out my email. I also usually do my blogging then also. I find things on PINTEREST and FB that gets my attention. This got my attention for sure. Oh my what a beautiful bathroom. 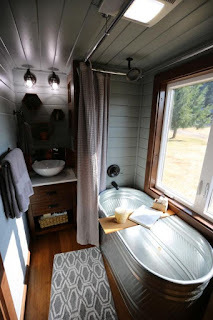 Course for me, I would have to have a shade on that window over the tub. But the tub is amazing, a horses watering trough. I love it. Speaking of which, what do you think of this room? Love the natural colors, love the rock, love it being open....love all the windows for the day time but there again I would have to have something over them at night...haha. Curtains would help warm up the room in the winter but also in the over all look of things...just not sure how I would hang them. Okay...here is the Zodic signs~ which is your sign? Do you believe in them? How close does your sign describe you? Mine....pretty much spot on.